"Once a year, or oftener, usually in November, an exploration is made of the interior of the aqueduct from end to end, by Mr. Benjamin S. Church, the resident engineer, who for over twenty years has been in charge of this part of the work. 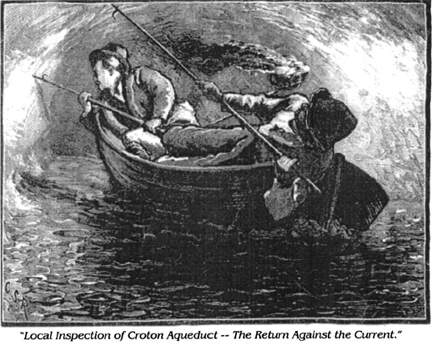 The water is shut off at the Croton dam, and the aqueduct is emptied by the waste wiers [sic] ... Many strange and exciting adventures befall the men detailed for this service; and though but one life has ever been lost, large parties have sometimes been in imminent danger. The man-holes having been opened previously, the laborers ... enter the aqueduct at the dam, and travel downward either afoot or in an ingenious car propelled by a crank like the hand-cars used on a railway. The effect is weird and awe-inspiring. Some of the men carry torches, whose smoke and wavering blaze curl and flash in the darkness and throw fantastic shadows and reflections on the moist walls. The voices reverberate like peals of thunder, and seem to awake responsive vibrations in the massive stone and brick work itself. In some conditions of the atmosphere, laborers repairing the masonry five miles below can be distinctly heard by those at the entrance, and at all times the human voice pitched in an ordinary key can be heard at a distance of two or three miles, in long low rumbles. A broad halo of light frames the men in, and behind this there is an impenetrable blackness . . . Thousands of tons of water are pressing against the gates at the entrance, and should a bar give way, or an order be misunderstood, the flood would rush down upon the unfortunates and engulf them with irresistible force .. ..
" ... In some cases it is not necessary to empty the aqueduct when a local inspection is to be made, and five feet of water is allowed to remain, -- enough to float the small metallic lifeboat which is used to convey the laborers from point to point. On one occasion, Mr. Church was in this boat with two men, who did not at all appreciate the weird novelty of the situation. . . . The water was so high that they could not sit upright, and they had to lie flat across the seats. In this uncomfortable position they traveled some distance, but . . . gradually lost all presence of mind, and by and by one of them lost his hat. Before Mr. Church could prevent him, he made a desperate effort to recover it, and, in doing so, tumbled overboard and was swept downward by the rapid stream. Fortunately, he could swim, and in a few minutes he was dragged on board again .... it was only with great difficulty that they kept afloat and eventually reached the opening."